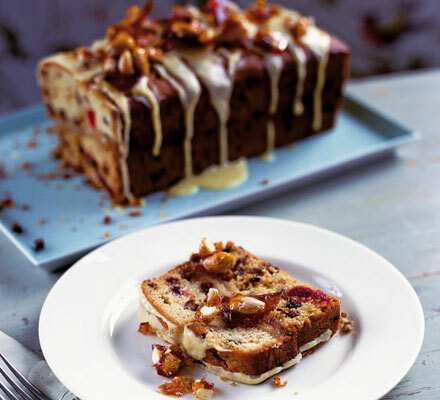 This is a perfect quick-mix-fix for Easter – based on traditional recipes. 1.Heat oven to 160C/fan 140C/gas 3. Tip the zest and juice into a bowl. Add the Cointreau, mixed fruit and cherries. 2.Meanwhile, grease and line the base and sides of a 2kg loaf tin with baking parchment. 3.Shape the marzipan into a sausage the length of the tin, then roll out to the width with a rolling pin. 4.Put the butter, sugar, flour and eggs and milk in a bowl and beat with an electric hand-whisk until smooth. 5.Stir in the mixed fruit and their juices. Spoon half the mixture into the loaf tin, then cover with the layer of marzipan. 6.Top with the rest of the cake mixture and smooth the top. Bake for 1 hr 50 mins until risen and firm to the touch. 7.Cool in tin, peel away the paper once cold. It will keep wrapped in foil for 2 weeks. 8.To make the caramel almonds, tip the almonds into a frying pan and heat, swirling the pan so the almonds toast. Tip from the pan then add the sugar to the pan and heat until the sugar turns to a liquid caramel – take care not to heat it too fast or it will burn. 9.Add the almonds, then pour onto a greased baking sheet to set. Will keep in a cool place for 2 days. 10.Decorate the cake on the day you eat it, as the caramel will dissolve on contact with the cake. 11.Mix the icing sugar with the orange zest and juice until smooth, then pour over the cake. 12.The mix is quite wet and will dribble down the sides. Chop the almond caramel, scatter over the icing and leave until the icing sets. This entry was posted in Cake, Easter. Bookmark the permalink.